Major General H.N. Campbell wass deputy chief of staff for plans and programs, Headquarters Air Force Materiel Command, Wright-Patterson Air Force Base, Ohio. 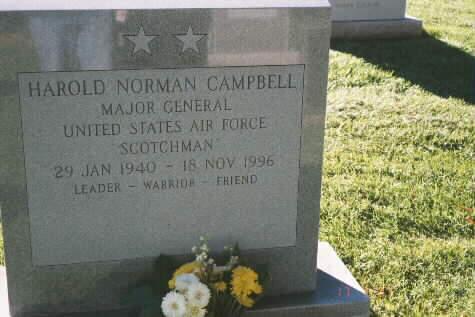 General Campbell was born in East Liverpool, Ohio, in 1940, and later became a resident of Florida. He was appointed to the U.S. Air Force Academy in 1957 and graduated with a bachelor of science degree in 1961. He earned a master of science degree in systems management from the University of Southern California in 1974. The general completed Air War College as a distinguished graduate in 1975, the Stanford Executive Senior Management Program in 1981, and the Harvard Program for National and International Security in 1988. Upon graduation from the academy, the general received undergraduate pilot training at Reese Air Force Base, Texas. He remained there as an instructor pilot in T-33s, T-37s and T-38s until August 1966, when he was assigned to Luke Air Force Base, Ariz., for combat crew training. In March 1967 he began a combat tour at Bien Hoa, Da Nang and Khe Sanh air bases, South Vietnam, flying 300 missions in 0-1s and 0-2s, including 100 over North Vietnam. From January 1968 to July 1969 General Campbell was assigned to the academy as an air officer commanding. He then became a tactical officer there. In January 1971, after completing F-4 operational training at Davis-Monthan Air Force Base, Ariz., he returned to Southeast Asia with the 388th Tactical Fighter Wing, Korat Royal Thai Air Force Base, Thailand. There he flew 150 more combat missions in F-4Es while serving as flight commander, chief of the command post and wing executive officer. His next assignment was as a tactical forces programs officer, Directorate of Programs, Headquarters U.S. Air Force, Washington, D.C., in January 1972. After completing Air War College in July 1975, General Campbell was assigned as deputy commander for maintenance, 50th Tactical Fighter Wing, Hahn Air Base, West Germany. He remained there for a year and then was transferred to the 36th Tactical Fighter Wing, Bitburg Air Base, West Germany, where he successively served as deputy commander for operations, vice commander and commander, flying F-4s and F-15s. director of programs and chairman of the Program Review Committee. In October 1984 he was assigned as vice commander of the Ogden Air Logistics Center, Hill Air Force Base, Utah. In September 1985 General Campbell became deputy chief of staff for logistics, Headquarters U.S. Air Forces in Europe, Ramstein Air Base, West Germany. He became deputy director of the Defense Logistics Agency, Cameron Station, Alexandria, Va., in October 1987. In October 1988 he was assigned as assistant deputy chief of staff for logistics and engineering, Air Force headquarters. He became deputy chief of staff for plans and programs, Headquarters Air Force Logistics Command, Wright-Patterson Air Force Base, in March 1991. He assumed his current position in July 1992. The general is a command pilot with more than 4,000 flying hours, of which nearly 1,000 were in combat. His military awards and decorations include the Distinguished Service Medal, Silver Star, Legion of Merit with two oak leaf clusters, Distinguished Flying Cross with four oak leaf clusters, Bronze Star Medal, Defense Meritorious Service Medal, Air Medal with 29 oak leaf clusters, Air Force Commendation Medal with two oak leaf clusters, Army Commendation Medal, Presidential Unit Citation, Republic of Vietnam Air Gallantry Cross with silver wings and Republic of Vietnam Gallantry Cross with Palm. He holds an Army parachutist rating, and wears the Senior Missile and Senior Maintenance badges. He was promoted to major general July 1, 1987, with same date of rank. 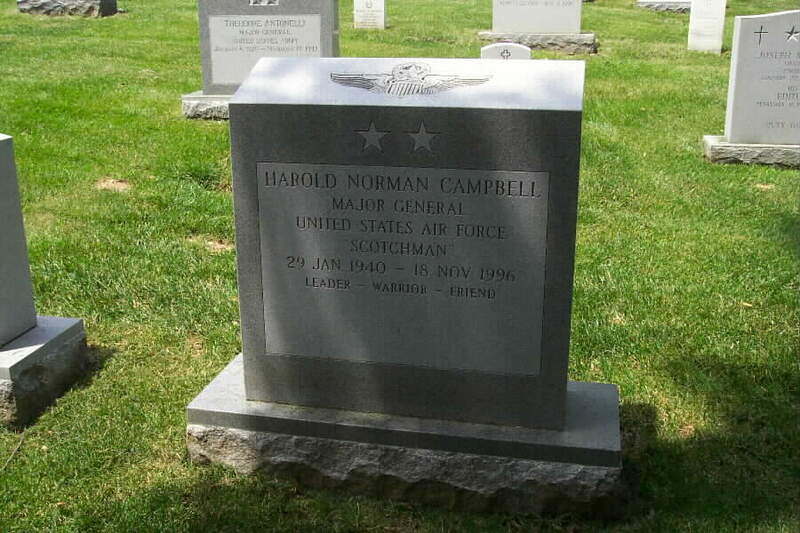 General Campbell died on 18 Novembr 1996 and was buried in Section 7-A of Arlington National Cemetery. The Air Force said tonight that it was investigating reports that a two-star general had disparaged President Clinton in a speech, calling him, among other things, a "pot-smoking" and "draft-dodging" Commander in Chief. The investigation, disclosed tonight by The Washington Post, was confirmed by an Air Force spokesman who identifying the officer as Major Gen. Harold N. Campbell. Such public comments by a high-ranking officer about a President are rare and can lead to the discharge of the officer. Military law prohibits contemptuous comments by officers about their civil leaders. General Campbell was made his remarks about the President on May 24 as part of an awards program at a NATO base in the Netherlands, The Post reported, quoting people who attended the program. General Campbell is chief of plans and programs at the Air Force's Materiel Command at Wright-Patterson Air Force Base near Dayton, Ohio. Major Paul Wilson, a spokesman at Wright-Patterson, confirmed tonight that an investigation of the general's remarks was being conducted but said there would be no immediate comment from him. The spokesman said General Campbell had been in the process of being transferred to the Washington area where he was to have taken command of the Air Force's Defense Fuel Supply Center. That transfer, the spokesman said, has been put on hold. General Campbell, The Post said, is 53 years old and a former fighter pilot who served two tours in Vietnam and won numerous citations, including a Silver Star for gallantry. On June 8, 1993, the Washington Post reported that Major General Harold N. Campbell was being "investigated on charges that he ridiculed President Clinton as a 'gay-loving,' 'pot-smoking,' 'draft-dodging' and 'womanizing' commander in chief at a [May 24, 1993] banquet for U.S. Air Force personnel in the Netherlands." According to a July 8, 1993, Associated Press article, Campbell "retired after he was reprimanded and fined about $7,000 ... for his comments about Clinton." The Air Force investigation's report, according to the AP, also concluded that Campbell had "planned the remarks."